From California to Greece, teachers are fighting attacks on education. Striking Greek teachers write that they stand with Los Angeles's teachers strike. Teachers strike in Athens, Greece, January 14, 2019. Association of Teachers, "The Parthenon"
A key tool of austerity politics, globally, has been the dismantling of social services. All over the world ruling classes have been attacking health care, public education, pension plans — services that not only make life and life-making possible for working-class communities but that also contain within them an important anti-market logic. This is why, in recent years, we have witnessed struggles in the sphere of social reproduction carry a particularly militant charge. What we are witnessing is the working class rising to defend the infrastructures of their lives. Working-class women have played a key role in these struggles as they both account for the majority of jobs in the care sector, as well as bear an unequal burden from their dismantling. Socialists must see the teachers’ strike wave, globally led by women, as a defense of working-class lives and futures. This explains why the wave is global. Here we reproduce a solidarity statement from striking Greek teachers to their comrades in Los Angeles. To repeat the slogan of the International Woman’s Strike: solidarity is our weapon. 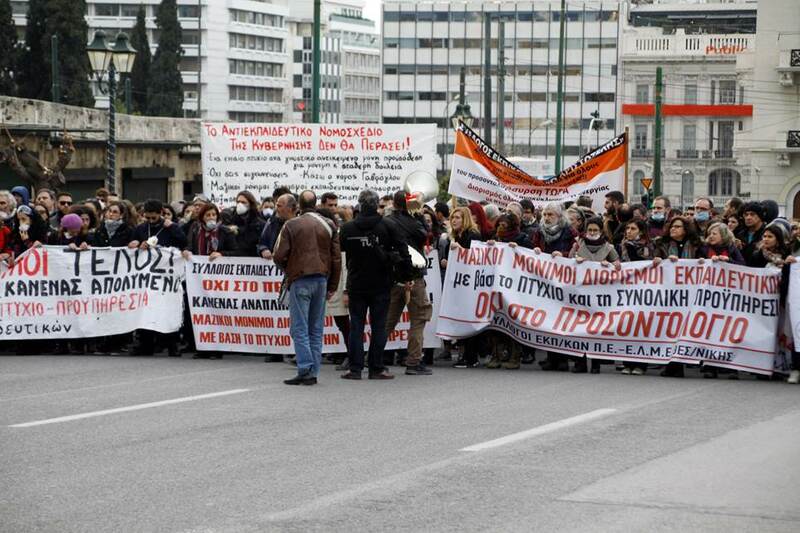 Substitute teachers, local teachers unions, and students in Greece.